First I applied one coat of Paparazzi, then one coat of Red Ocean and then again one thin coat of Paparazzi. Because of the jelly finish of the Paparazzi, it is very suitable for such a layering and I think it looks perfect in this combination. The flakes and the glitter makes it look lighter. It sparkles without hurting you eyes. What do you think? Do you share my excitement or do you find it lame? :stars: That is very pretty. I love the jelly look to the polish. The flakes look like they glow. Beautiful. That looks stunning! Love the result of the layering. Very pretty! 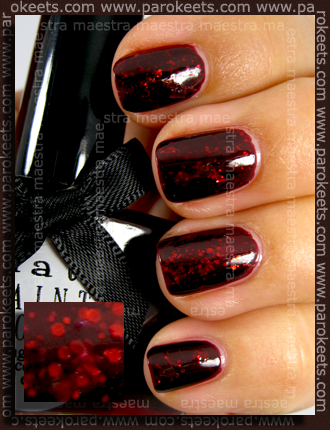 I like the idea of layering a jelly over glitter – looks great! V tej kombinaciji je krasen! Sam pa … boh :). Le da so tukaj seveda večje bleščice. Hehehe, come and kidnap me, if you can. :silly: Hvala, nihrida! Amarena, tudi mene spominja na Stroll, čeprav Stroll-a še nisem videla v živo. In ta je posebna, ker ima toliko raznoraznih bleščic, ki so opazne, a ne bodejo v oči.